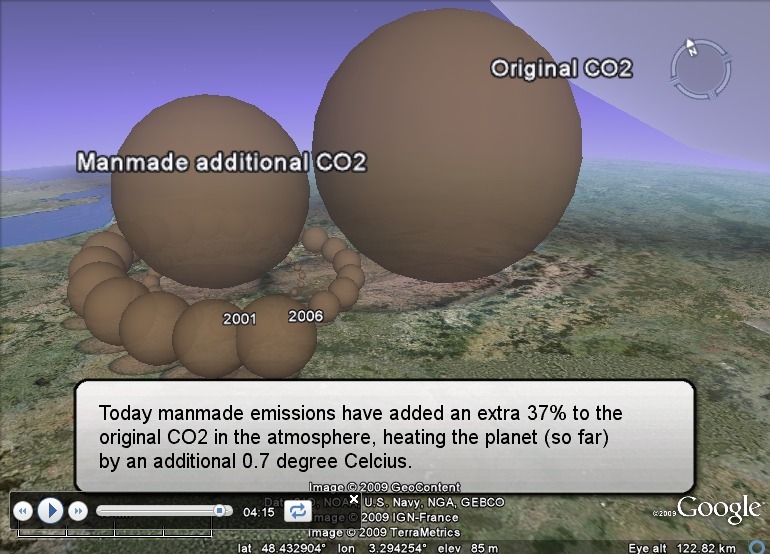 This is a reference page for the CO2 Bubble KML. Please see the full script used in the KML below, with references. Thanks to 3dHH for the low-polygon Eiffel Tower model from the Google Sketchup 3D Warehouse used in this KML. The CO2 spheres, coal pyramids and big atmosphere sphere in this KML are shown at the correct size (sea level pressure is used for the gas spheres). The calculations can be found below. 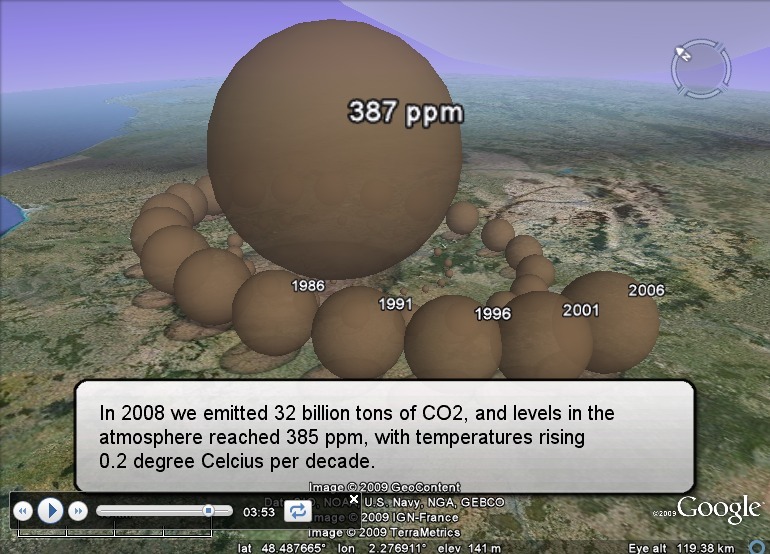 Emissions in this KML are mentioned either in tons of carbon, tons of carbon dioxide (CO2), or tons of coal equivalent. 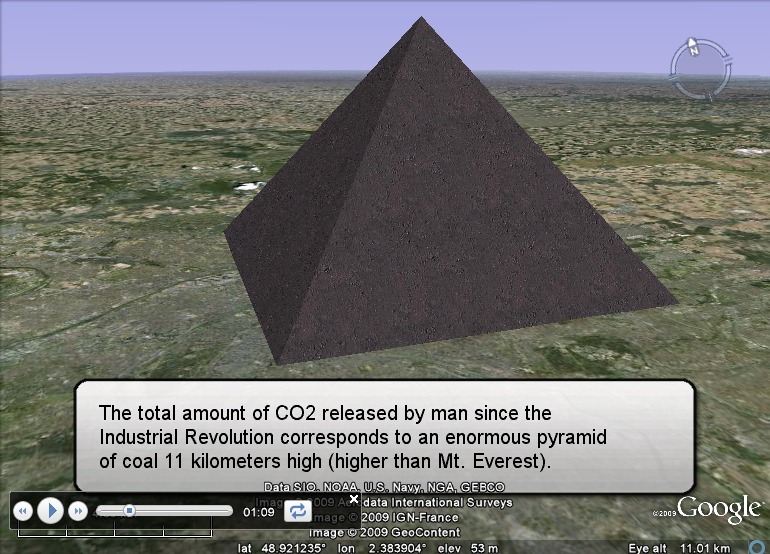 They compare as follows: 1 ton of carbon = 3.67 tons of CO2 (44/12) = 1.74 tons of coal (44/12 / 2.107). 530,000,000,000 tons of carbon * 44g CO2 / 12g C / 2.107 g CO2 / g coal = 922,322,417,339 tons of coal. ... / 0.833 ton/m3 (density of bituminous coal) / 109 m3/km3 = 1,107 square kilometers of coal. (3 * 1107 * 3/2)(1/3) = 17.1 kilometer side and 17.1*2/3 = 11.4 kilometer high. 8,700,000,000 tons of carbon * 44g CO2/12g C / 1.977 kg/m3 (density of CO2 at 1 atm) = 16,136 square kilometers. ... which makes a sphere (3/4 / π * 4400)(1/3) * 2 = 31.4 kilometers across. into a single sphere at sea level pressure. 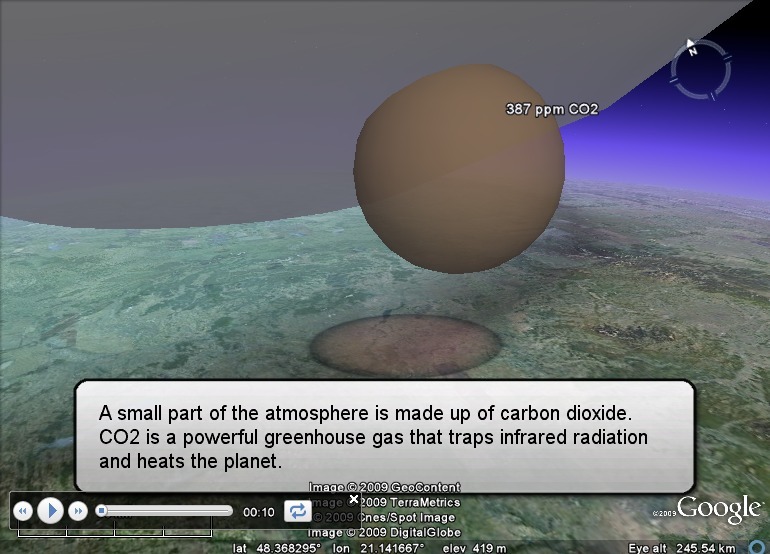 A small part of the atmosphere is made up of carbon dioxide. CO2 acting as a greenhouse gas has been known since 1859.
other fossil fuels, releasing more and more CO2. a pyramid 1120 meters high. 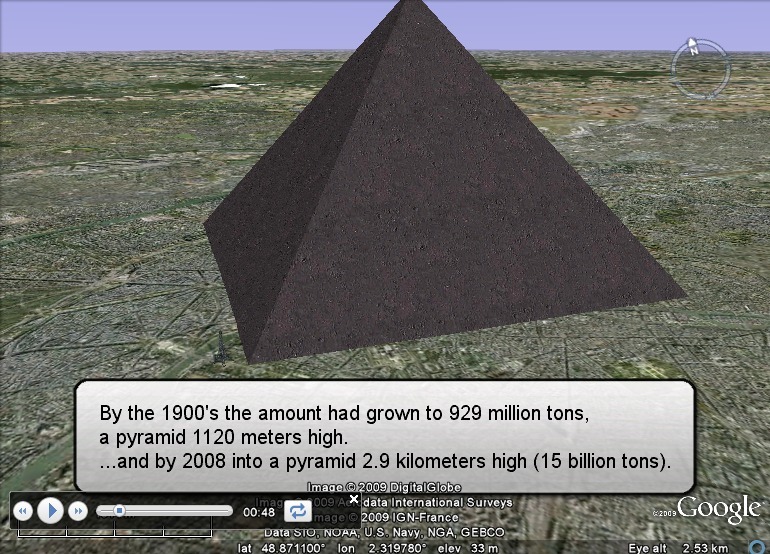 ...and by 2008 into a pyramid 2.9 kilometers high (15 billion tons). 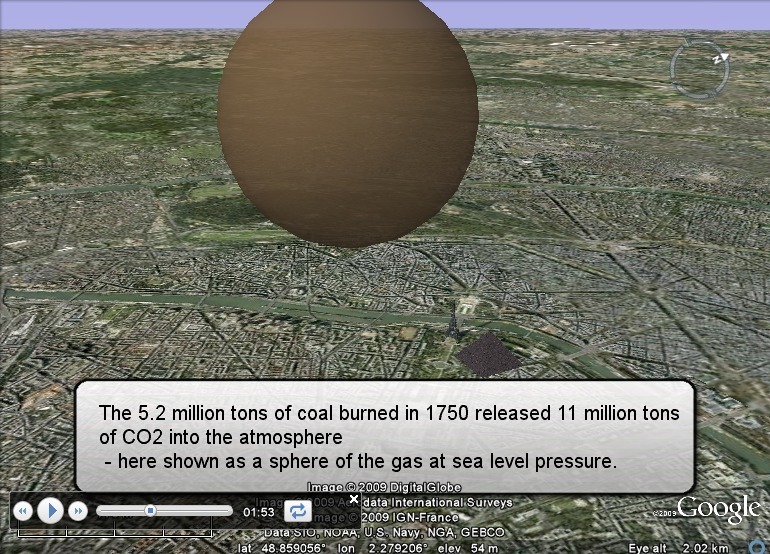 the final third - but in this display all emissions are shown as coal. of coal 11 kilometers high (higher than Mt. Everest). we will have lost the chance to avoid irreversible climate change. - here shown as a sphere of the gas at sea level pressure. concentration of the gas in the atmosphere. first step towards understanding the Global Warming of today. of fossil fuel emissions in the atmosphere were calculated. and oceans, in turn causing ocean acidification and coral death. fast CO2 is building up in the atmosphere. 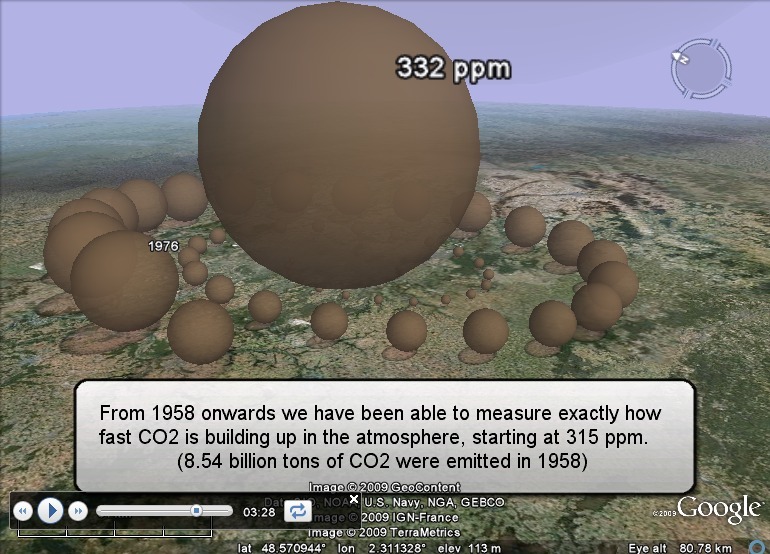 Atmospheric CO2 was at roughly 315 ppm when measurements began. the level today recognized as safe in the long term. countries commit to reducing emissions. 0.2 degrees Celsius per decade. by 1.5 ppm/year, today by 2 ppm/year. by an additional 0.7 degrees Celsius. 2007 (shrinking to 40% below long-term average). many of the worst effects of climate change.